I used the sketch over at Tuesday Morning Sketches. I've also managed to include the challenges from Crafty Catz (Animals) and Allsorts (Paper Piercing). Paper: No idea! I got it in a swap. Feels like Basic Grey or DCWV though...! Copic Markers: E29, E31, E33, E35, E37, E50, E51, E53, R35, R37, R59, YR23, G21. Embellishments: Whimsy Sentiment, ribbon and gems from stash. That looks lovely again Stacey! Really cute! Super cute card Stacey! I love how the image matches the paper. Very cute. Thanks for joining us at Tuesday Morning Sketches. what a brillant image, thanks for joining us at crafty catz this week. Great card Stacey. The image is fun and a great choice of paper. 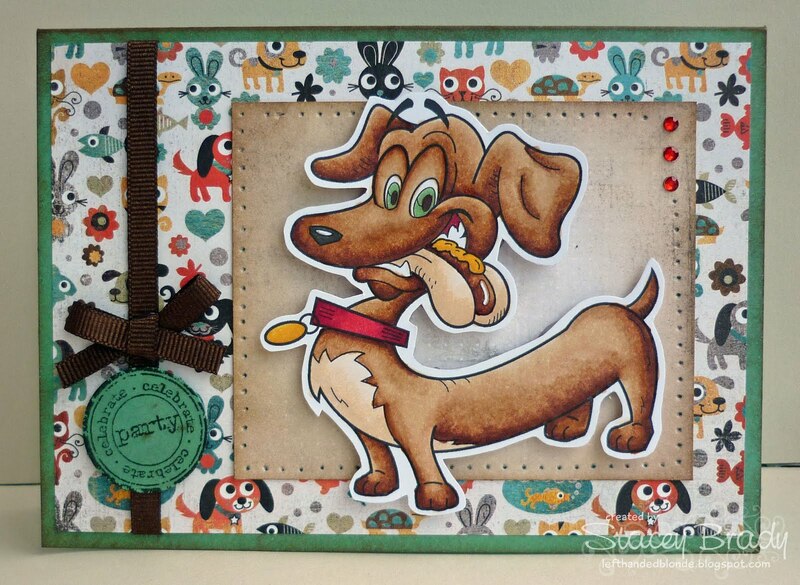 What a really fabulous card, thank you so much for sharing with us at Allsorts Challenge this week and good luck. Oh he is fabulous Stacey, wonderful card. Awesome coloring job. Cute card.